There is one item I absolutely fell in love with this year - the Coobie scoopneck bra. It is the most comfortable and versatile bra I have ever tried out and you can wear it for everyday wear, work, the gym, yoga and more! The Coobie Seamless Scoopneck Bra is available in a range of colors and prints. What makes this product unique is that it's one size fits most. 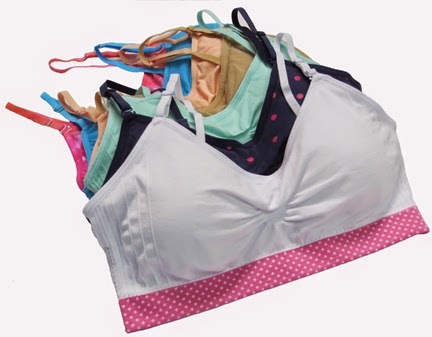 Comfortably fits sizes 32A to 36D! I work from home most days of the week and practically live in Yoga clothes. When I turned into that girl, I will never know. Unless I leave the house, this is what I wear on a daily basis. I've actually fallen asleep in them on multiple occasions. They're seamless, so no hooks or clasps. The back is smooth. Each has removable pads and the straps are adjustable. I am giving away FIVE of these bra's! So there will be multiple winners on this giveaway. Check out the multiple colors online and let me know in a comment below which one you would choose. You should see a Rafflecopter Widget below this - after you comment, go through the widget to gain your first entry and unlock more chances to win. If it doesn't appear right away, please give it a few minutes and refresh. one of each please? I'd start with black. I'd love the purple striped one! Love the wide nautical stripes! I love the baby blue and the periwinkle. Both so cute! Oh, I'm a sucker for anything pink! I like the purple tIe dye!! The black since it goes with everything. I would love to try one of these! I like that they are padded. I really like the Coobie in Pomegranate! I love the thick striped bra!! It is so cute!